A tower block fire that left six people dead, including a three-week-old baby and two children, is being treated as suspicious until a cause is determined. 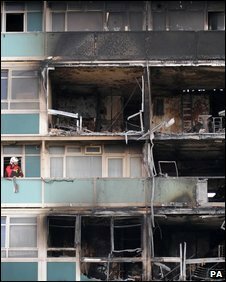 About 30 people were rescued from the fire at the 12-storey Lakanal House on the Sceaux Gardens Estate, Camberwell. 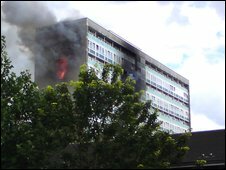 The blaze started on the ninth floor, at 1620 BST on Friday. Ch Supt Wayne Chance said: "We would always treat a situation like this as suspicious because we don't know the cause... in the first instance." Mr Chance said residents were not being allowed back into the premises because it was being treated as a crime scene. He said the fire, which was tackled by more than 100 firefighters, had spread rapidly to the 11th floor. Police: "No information to suggest that any of the victims were particularly targetted"
The bodies of a six-year-old child and two adults were found at the scene. The three-week-old baby, a seven-year-old child, and a woman were later pronounced dead in hospital. Mr Chance said the victims came from "a number of families". Post-mortem examinations are being arranged. Of the 30 people rescued, 15 were taken to hospital for treatment, including three who died. One person, a firefighter, remains in hospital where he is being treated for minor injuries. Eyewitnesses described how the tragedy had left people in the area "shocked". A London Fire Brigade (LFB) spokesman said preliminary investigations have been carried out at the scene by two specialist teams. "They will be working alongside our firefighting crews," he said. Fire bosses believe it will take "weeks if not months" to establish how the blaze, in south-east London, happened. In addition to the 30 people who were rescued, at least 120 people were evacuated from the building. Those who were forced to leave their homes were taken to an emergency centre, set up by Southwark council in nearby Welton Hall. The vast majority stayed with friends or family overnight and 20 were provided accommodation by the council. Firefighter Paul Glenny, who tackled the blaze, said: "I've been in the job for 30 years, and I've never seen anything like it. "The hot weather and the fact that people's windows were open made the fire what it was." Carol Hunter, who lives in a building that backs on to Lakanal House, described hearing a "huge bang and then flames were everywhere". "It was horrible. We saw lots of children banging on the windows to get out and families screaming," she said. "There was even bed sheets tied together hanging out of windows with people threatening to jump out. We saw body bags coming out. I felt sick." Nancy Kanu, who lives on the fifth floor, said she saw smoke coming in through her window and in the stairwell. Speaking from the emergency centre, in Bushey Road, she said: "We were really scared because we couldn't walk - we were crawling through the smoke. "My sister was there with her three-day-old baby, who is now suffering breathing problems and I was there with my two kids." 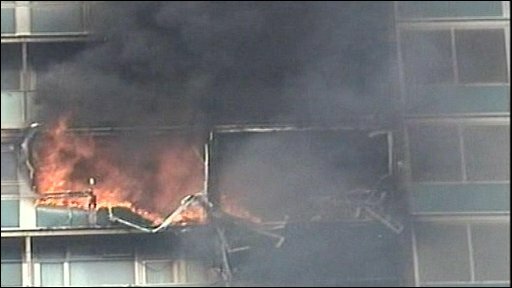 Architect Alastair Bowden, 31, who lives nearby, said: "It's quite dramatic to see a tower block on fire. It has shocked everyone." Harriet Harman MP, whose constituency includes the tower block, said it was "clearly a very tragic situation". She said: "There will have to be a thorough investigation into what caused this fire and whether the prevention was adequate." Southwark council leader Nick Stanton described the incident as "ghastly" and said it was likely to be "days if not weeks" before tenants could return. 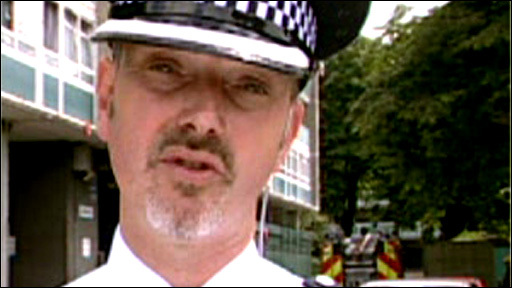 He also praised the work of the emergency services, saying he was "in awe of the courage and professionalism" shown. The Metropolitan Police said it was still too early to say how the fire started and that officers were working with the LFB's investigation team to establish the cause. It said its priority was to make the building safe. Residents worried about relatives can call 0300 123 1212 for further information. You can also send your pictures to yourpics@bbc.co.uk or text them to 61124. If you have a large file you can upload here.